Coral are one of the leading bookmaker brands in the UK and they’re recently joined forces with Ladbrokes to form a betting super giant! They have a generous bonus which will appeal to all new customers and a stack of promotions including the Build Your Bet Leaderboard and 4+ Acca Boost. Once your first bet has been settled, then Coral will credit your account with a free bet to the tune of £20. 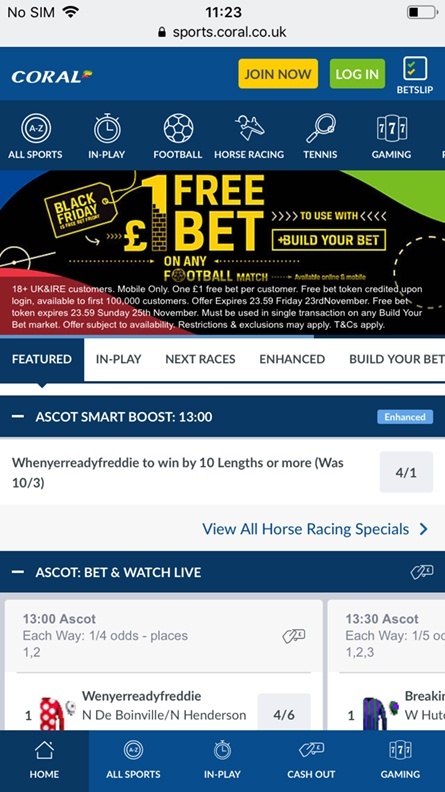 This free bet can be used on any sports betting market although bear in mind that winnings will deduct the free bet stake so it sometimes pays to look beyond a bet on a short-priced favourite. Betting customers want control over their bets these days. Many of us even want to choose our own betting market and Coral cater for punter demand with their Build a Bet service. It’s a simple case of choosing a football match, pick your markets and get an instant price. This service is available for over 100 football leagues and competitions. Once you have built your bet, you can then choose the stake you want to wager and see if it’s successful. In order to compete on the Build a Bet Leaderboard, you are required to bet at least £1 on your selection. If the bet wins, you will be added to the leaderboard in accordance with how big the price was. Every month, Coral run the Build a Bet Leaderboard and the winner will walk off with a £10,000 cash prize, while there is £15,000 available to be shared between the next nine on the list, meaning that this is something you should definitely check out when you become a customer. Coral are ahead of the curve with their live streaming service and they are proud of being able to stream live Spanish football to their customers every weekend, meaning that customers can watch Real Madrid, Barcelona and Atletico Madrid in action when they play La Liga matches. 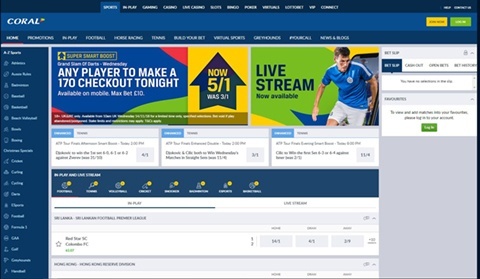 The same applies to Serie A games and customers simply need to place a £1 bet on any sports betting market to access the live stream. Look out for the Coral live streaming icon when it comes to the available matches or alternatively you can visit the Live Stream page and check out the upcoming fixtures. Horse racing fans are also able to enjoy live horse racing streaming thanks to Coral’s deal with At The Races and Racing UK. 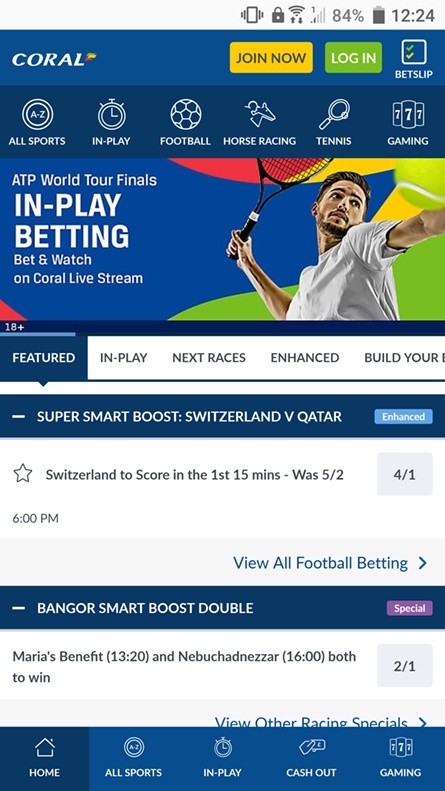 It’s a simple case of betting at least £1 on the race you want to watch and the live streaming is available whether you are watching on desktop, mobile or through the Coral app. When it comes to football, horse racing and golf, Coral will regularly offer extra places on the top events. Indeed, there are extra place races when it comes to horse racing, while the big golf tournament of the week will also see this bookmaker extend their place terms to seven or even eight golfers. Football punters can also enjoy something called 4+ Acca Boost where you can enjoy a free bet up to £100 when you land a winning accumulator bet. That’s because they will pay customers an extra 10% on their acca winnings when they put together a winning acca with at least four selections included. We should also mention the Coral Bet & Get Club where customers can land £10 in free bets every week. Just be sure to log into your account, opt into the Bet & Get Club and accumulate £25 in settled bets on any sports markets. These bets have to be placed at evens or bigger in order to qualify for this offer. The Coral app is popular with customers thanks to the fact that it’s easy to download and allows you to access the same first-class service that is available through the mobile browser but without any hassle. You can Cash Out using the iOS and Android apps and also access the banking service to make deposits and withdrawals. Coral have got some robust payment methods available to customers who can choose to use a bank card or alternatively one of the e-wallet options that are made available. For UK customers, the most popular option remains Visa, Maestro or MasterCard, with PayPal something being used more widely. There is also the option to go for Skrill (which has a 1-Tap option), Neteller or Paysafecard. It’s a simple case of selecting “My Account”, clicking on Deposit and then you have the choice to add your payment method before a corresponding amount. You can deposit from as little as £5 and this is a safe and secure process.